While last minute frenzy is a popular theme in the US media these days, our small household is enjoying a well earned oasis of peace. Our children are grown and holiday packages were shipped in mid-December. This might be our last holiday at home for a bit as a grandchild will arrive in the New Year and that might draw us out west for the 2013 holiday season. But, for now, we are home together and using the time to relax and catch up on miscellaneous tasks. For me, that involves fabric and sewing. I have a number of projects in process. Here is a glimpse at one. 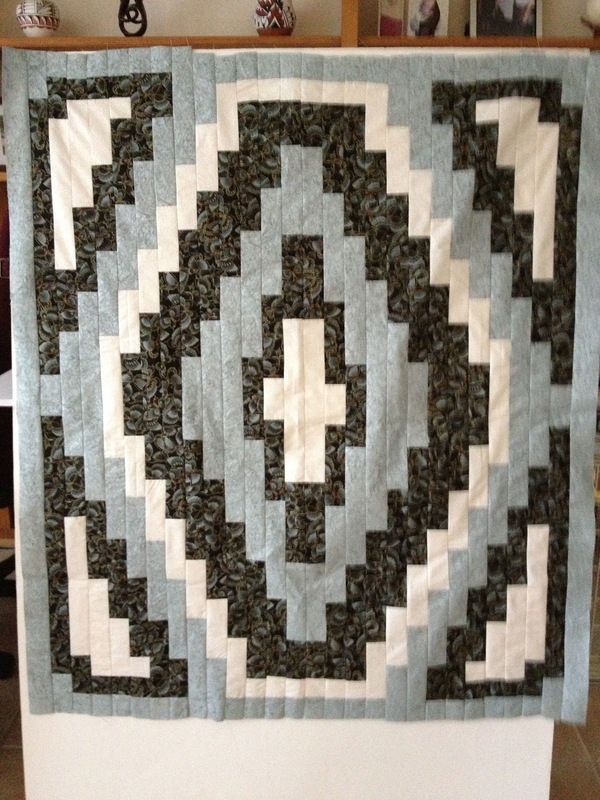 For over a year, I have wanted a new lap quilt for our family room. I almost got one made earlier this year but then I decided it needed to go to our new grand-daughter's room. While going through my fabric stash for another project, a few fabrics jumped out at me and I just had to make something from them. I remembered a pattern I had made several years ago that might work. Requirements were that it be fast and easy :) and that I had enough of the three colors to make the quilt. The pattern is called Turquoise Diamond and is from Southwest Decoratives and dates from 1997. You can still get the pattern online from them. 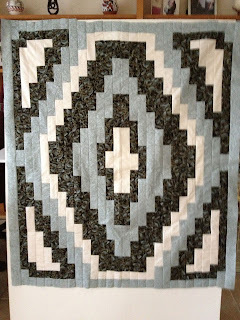 I know that I got it at one of my favorite quilt stores in Sedona, AZ - Quilter's Store Sedona. It is a really easy pattern to piece - all strips. You don't actually need as much fabric as the pattern states and I tend to cut the pieces in groups, rather than all at once, so I don't get too confused. This is the second time I have made the pattern and I have yet to use the suggested color pattern. It is actually easy to adapt - I believe the last time I used different colors for the center area that for the rest of the quilt. The pattern comes in two sizes - bed size and what they call 'wall hanging' size. That is actually the size I use for a lap quilt. If life stays calm for the next few days, I expect to finish this up and be enjoying it as I welcome in the New Year! Blessings for a warm and happy holiday!